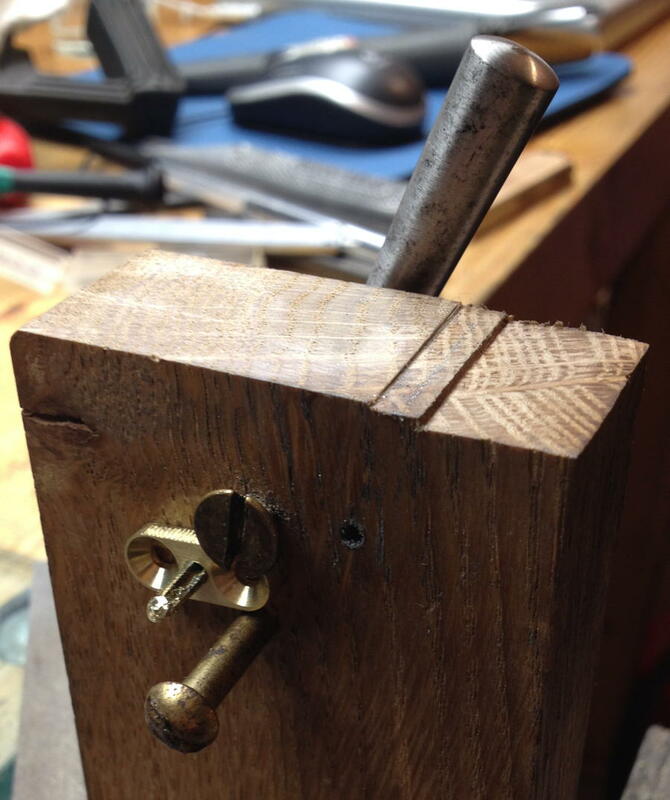 Quite a while ago I wrote a post about making nut plates for the doorbell project. Since I need twelve of them for a real instrument, and they will need to be accurately inset into the bellows frames, it made sense to program my CNC mill to produce them. 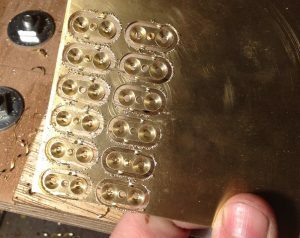 I tapped them all by hand using my ultra-high-tech tapping jig. Here is the finished batch of nut plates, plus one of them set into a piece of scrap plywood the same thickness as the wood I’m going to use for the bellows frames. They have rounded ends so that I can cut the inset using a router bit in the CNC mill without having to manually square up the corners with a chisel afterwards. 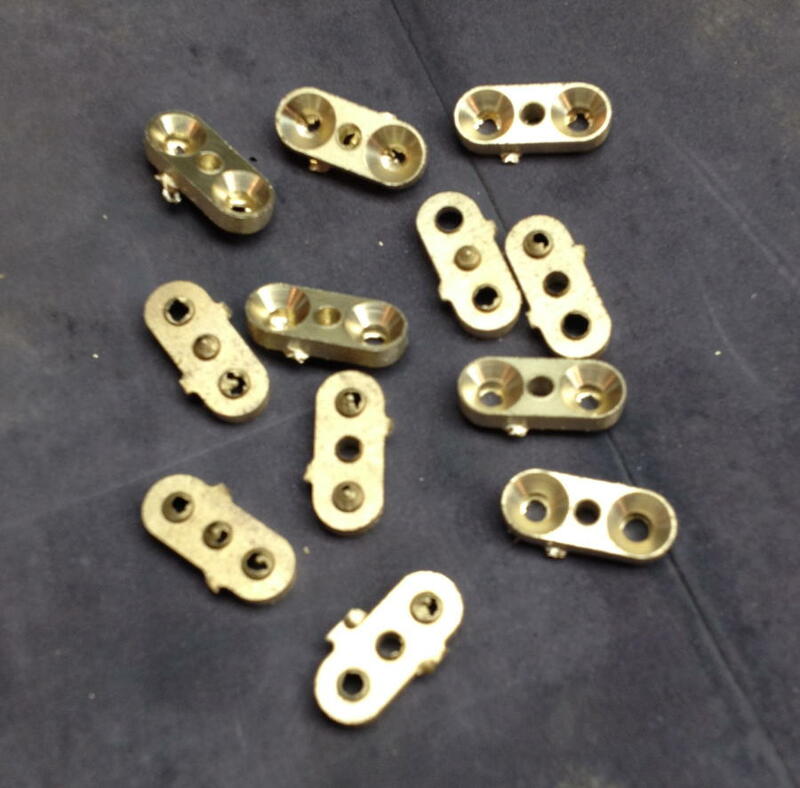 Looking at the finished brass nuts with an M3 thread in, the “space” at each side is (maybe) another couple of 3 mms => a nut width of 9 mm. Leaving maybe 2 x 1 mm to each frame edge, makes it 11 – then “a little air”…11.2 – 11.4? Then there is the room for the sloping (in)sides (for the reed pan)…0.6 mm? Altogether a thickness of 12 mm – which is twice of what I would expect. And the frames in the end boxes? What I really am questioning is the M3 end bolts. Why not M2.5? Finally: With all respect for the precision of CNC tools… but will you make the thread holes before assembling / mounting the end box on the bellows? 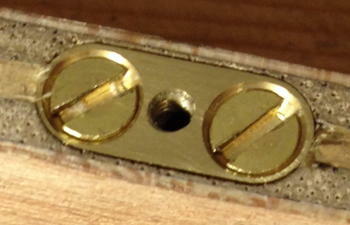 Or use the actual holes in the end box as guides for the threads? The nuts are 7mm wide and I’m planning to make the sides 9mm thick (I originally intended to use plywood, but I had second thoughts and will probably go with solid Sycamore instead). The piece of plywood in the last photo is 9mm. I’m hoping that if the nut is central in the bellows frame, the 1mm on the inside of the nut will provide enough room for the reed pan taper. I’ll probably make the action box sides 9mm too. I picked M3 simply because when I ordered the bolts I happened to have the Bastari instrument that I wrote about a few weeks ago open on my bench: that has M3 bolts, and they didn’t look excessively large. In hindsight maybe I should have bought No. 3 or even No. 2 wood screws because that would have allowed me to make the nuts a bit smaller. 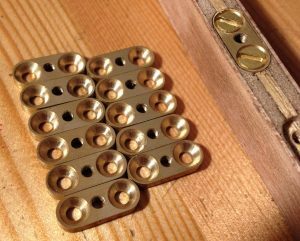 I intend to try to drill the bolt holes in the action boxes separately from setting the nut plates into the bellows frames. In theory, getting them to line up shouldn’t be a problem if I get the box mounted to the table square and correctly referenced, and use a centre drill to spot the holes so that deflection isn’t an issue.